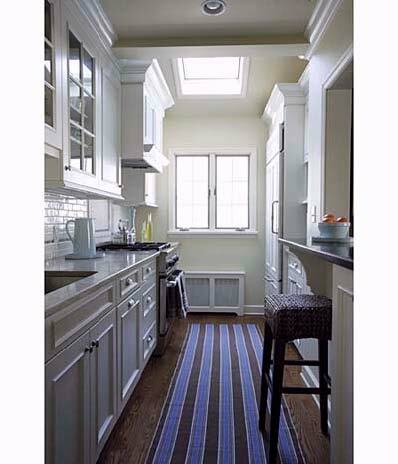 For maximum efficiency when short on space, this layout excels. Its two parallel counters make all points of the work triangle equally accessible. Important things to keep in mind during your design are; aisle space, light and storage. In this kitchen (pictured), concealing the fridge and dishwasher behind cabinetry panels gives the small space a tidy look. Light-colored cabinets, open shelving, and a large pass-through window make the galley open and airy. Defined by simple lines, natural and handcrafted materials, and a muted palette, this Shaker-style kitchen (pictured) is smart and functional. The large wall-hung plate rack makes attractive dishware a visual focus, and offers quick access when setting the table. Small apothecary drawers alongside the range make use of often wasted space, while base cabinets are fitted with pull-out shelves and full-extension drawers to maximize storage. The island is perfect for meals, with a cast-concrete counter and a triple-pendant lamp overhead. 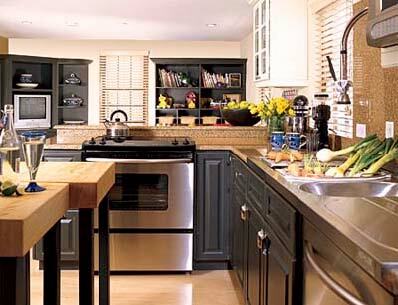 Designed for a older couple, this kitchen (pictured) tucks away great tricks for a comfortable lifestyle. The lighting scheme removes the risk of over lighting or glare by using undercabinet fluorescent strips and large milk-glass pendant globes. Easy-to-pull handles are used on the refrigerator and dishwasher, the latter of which is a drawer, eliminating the need to bend down to load and unload. The kitchen sink is equipped with a single lever and integrated sprayer hose, and the rangetop's continuous grill allows for easy movement of pots and pans without any lifting. Beauty and function live simultaneously in this small kitchen (pictured). The stylish concrete countertops are complete with a knife block and a built-in drain board. Adding bigger windows and getting rid of the surrounding upper cabinets opened up the space. Cabinets line the adjacent wall. 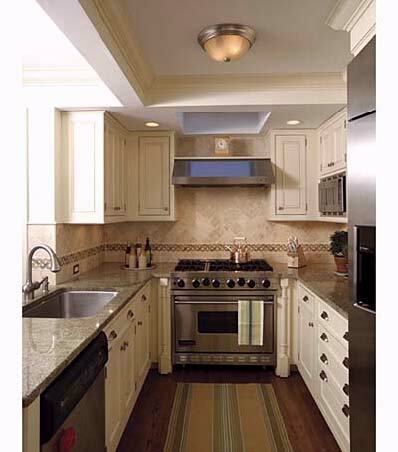 The professional range in this galley kitchen (pictured) serves as the focal point of the design. The configuration offers plenty of counter space, as well as lots of room for cabinets. A pass-through serves as a breakfast bar and looks out onto an intimate corner banquette for family dinners. A cozy gathering spot, this kitchen (pictured) is equipped with all the necessities of a professional chef's workspace. Two ranges, a large utility sink with an industrial-size pot washer, a pair of butcher-block islands on wheels, and wall-to-wall cabinets make prepping, cooking, and serving food easy as pie. The U-shaped layout of this kitchen (pictured) offers an efficient work triangle for its owners, a couple with a penchant for cooking. 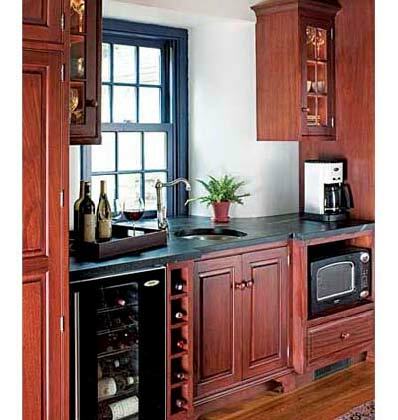 Wine cubbies above the window make use of often-overlooked space. Antique-white painted cabinets, dark green granite countertops, and original oak floors help stainless steel appliances blend into the 1874 farmhouse. Taking down a wall and replacing it with a breakfast bar opened up this 11-by-12-foot space (pictured). Additional counter space for prep was added with a second peninsula, which also anchors the work triangle. An existing tin ceiling and a brick chimney were uncovered, coordinating well with the antique pine base cabinets that were salvaged from the owner's grandmother's house. 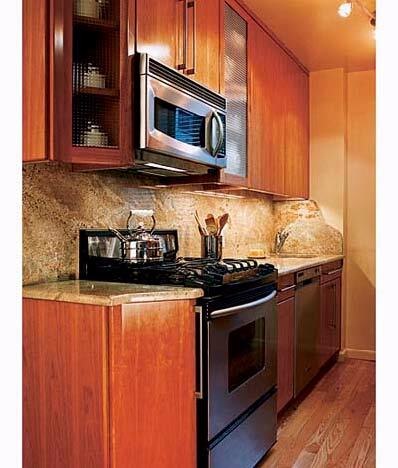 This galley kitchen (pictured) is efficient in its narrow footprint, with ample built-in storage and counter space. A pass-through window opens the room up to an adjacent dining area, while providing a two-seater breakfast bar. Glass-front cabinets with lighted interiors offer a visual focal point. This modest kitchen (pictured) is ideal for its setting in the historic district of Santa Fe, New Mexico. 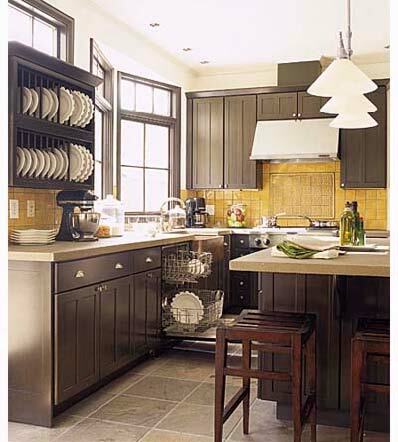 Black slate covers the countertops, backsplash, and floor. While custom cherry cabinets flank a s stainless steel range. The custom-made island serves as a centerpiece to the design. Chef Michael Lomonaco's plan for his 7-by-10 foot Manhattan galley kitchen (pictured) was simple: use every available space efficiently, without changing the basic layout. So he moved the sink faucet into the corner and the microwave to over the range - the only configuration changes he made - freeing up counter space for food prep. With five kids and a passion for cooking, this homeowner was determined to transform her pea-sized kitchen (pictured) into a comfortable working space. The solution? Packing every corner with smart storage solutions. This particular nook houses lots of cabinet space, a coffee maker, wine cooler, wine rack, bar sink, child-height microwave, and a kids' snack corner.